N96W14555 County Line Road (HWY Q), Menomonee Falls, WI 53051 | Find us on the web! Your vehicle is a major investment, and when you need auto body or collision repair, know you can trust our local, family owned shop. We have been in the auto body repair and paint repair business for over 35 years. Recommended by many insurers and agents, we work directly with your insurance company to help process your auto or truck insurance claim and make your experience as stress free as possible. Your vehicle will be repaired properly by our highly trained and certified technicians using the most modern and up-to-date technology and equipment available. 1Collision County line technicians have extended experience in repairing all vehicle makes and models. We pride ourselves in our quality repairs, our clean, state of the art facility, and our outstanding customer service. Our customer service area was designed with your comfort and convenience in mind. We offer you free drive-in estimates, loaner and rental cars when needed, complimentary refreshments, and a comfortable waiting area with free Wi-Fi. We also offer a limited lifetime warranty on your repairs. Trust 1Collision County Line with all vehicle auto body repair, ding and dent repair, hail repair, paint less dent repair (PDR), auto glass replacement and glass chip repair, and auto detailing services. 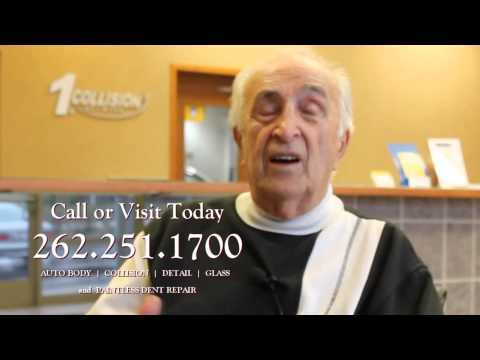 1Collision County Line proudly serves the auto body and mechanical repair needs of the greater Milwaukee area including Brookfield, Brown Deer, Germantown, Jackson, Menomonee Falls, Mequon, Milwaukee, Richfield, Sussex, Thiensville, Wauwatosa, and West Bend. 1Collision County Line is affiliated with the 1Collision Network, a group of Midwest Collision Repair Specialists in Milwaukee, Green Bay, Chicago, and Des Moines committed to operating professional, trusting collision repair centers that work closely with insurers to make your collision repair experience as seamless and stress free as possible. Trust 1Collision County Line to assist you with your auto insurance claim. From explaining and assisting in the claims process to setting up towing or a rental vehicle, we are happy to help. We strive to make the auto body repair process easy for you. Our ICAR trained and ASE certified technicians will return your car to original OEM specifications in a timely fashion, and all repairs carry a limited lifetime warranty. We offer state-of-the-art diagnostic scanning and our technicians have expertise in repairing all vehicle makes and models. Vehicle out of commission, and need to get it in? We offer 24-hour towing, and pick-up and delivery services, for your convenience. If you're driving on Interstate 94 on Tuesday, make sure you're following the law. State Patrol will have much more law enforcement in southeast Wisconsin for "Blue Day," according to the Wisconsin Department of Transportation. Heads up! Plan your routes accordingly, and have a great weekend! It's road construction season. Here are the projects going on in Menomonee Falls and Germantown. Here's what you should know about the summer road construction projects going on in the Menomonee Falls and Germantown areas. 1Collision County Line is feeling cold. Be extra careful in transit this week, folks! 1Collision County Line is feeling safe. Keep yourself, your loved ones, your vehicle, and those sharing the road, safe this weekend by driving free of distractions, mainly your phone. Use a dash mount for your phone to avoid looking away from the road. In newer vehicles, the capability to route your devices via Bluetooth for navigation, phone calls, and tunes makes your trip hands free and screen-less. 1Collision County Line is a professional collision and mechanical repair shop serving the needs of the greater Menomonee Falls WI area. 1Collision County Line specializes in auto body repair and painting, hail damage repair, paintless dent repair, auto body detailing, glass repair and glass replacement. 1Collision County Line accepts all major credit cards. 1Collision County Line is affiliated with the 1Collision Network.